It is known that the Forest of Dean and the Severn Valley were covered in dense woodland at the time the Romans occupied Britain. While we don't think Longhope dates back to Roman times it is highly likely Longhope was founded in Saxon times. This is suggested by the fact that three saxon cross bases still exist in the village, one in the churchyard of All Saints', another near the site of the former Plough Inn and one at Dursley Cross. It has been disputed that the base in the churchyard is not that of a cross but that of the old mediaeval font before it was destroyed. At the visitation of 1548 by the then bishop, John Wakeman, it was found that Longhope had sold items of value from the church, namely a pyx, cross and chalice, to pay for soldiers to be sent to Scotland and also for "thamendyng of the highe waye betwixt the said parisshe and Huntleye"  . In 1642, Royal Spring (formerly an inn) was named by Charles I when he stopped here on his way back from the Battle of Powick Bridge near Worcester, to drink from the spring, or maybe sample the local wine produced from locally grown grapes. The list of men fit for war in 1608. In Chancellor Parsons' survey of the diocese in about 1700 he noted that several houses and land that was to be used for the upkeep of the church and caring for the poor and wounded soldiers were not being used as such. This was rectified by a commision directed to Sir John Hungerford, Sir Henry Winston, Sir Robert Partridge, Robert George and Geore Masters Esqs. who gave "12 or more substantial men of Longhope to direct income from lands and heriditaments to the value of 20 marks per year to these end"  . Not all the citizens of Longhope were honest and law-abiding. The Churchwardens' Accounts for the parish recorded outcomes of trials and any fines that were handed out to the unsavoury. In 1712, for example, a parishoner whose name was unrecorded in the accounts was fined 6d for "swearing a Constable or Tythingman". There are others including the use of a dog to kill a hare. Longhope Church of England School was built in 1829 on glebe land (land belonging to the church) close to what is now the old rectory. The original school building still exists but is due for demolishon as it has become unsafe. Log books were kept by the headteacher from these early times and have survived to this day. A police station was built in Longhope in the Latchen in the 1850s and was on the left hand side of what is now known as Brook House. The other half was the village shop. Owners of the local pubs since 1856. List of residents in the Parish in 1885. A collection was made to help the families and survivors of the Titanic disaster in 1912. At a service led by Reverend Murray Penfold, of Longhope, a new plaque was erected on the top of May Hill to replace one put there in 1877 to commemorate the plating of trees for Queen Victoria's golden jubilee. The original had been missing for many years and no-one could remember the exact wording of it. The plaque read: "This plaque replaces one which was erected in 1877 by the Parish of Longhope at the planting of these trees to commemorate the Golden Jubilee of Queen Victoria. At the same time the land within the ditch was given to the Parish for all time". The silver jubilee (25 years) of George V on 6th May 1935 was celebrated by a large gathering of people on top of May Hill to see the beacon and were treated to tea and scones  . Not many people know about the Longhope lifeboat tragedy of 1969. This may sound strange due to the fact that Longhope, being in a valley, does not have any access to the sea. This is easily explained by the fact that the other Longhope on the Isle of Hoy in the Orknies has since 1874. The lifeboat TGB was launched on the evening of March 17th, 1969 to lead assistance to a Liberian cargo ship by the name of Irene. 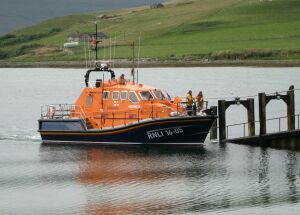 Sometime after 9:30pm the same evening, when the lifeboat was last seen, it capsized with the loss of the entire crew. The population survey of 1981 showed that, although 180 new houses had been built since the end of the Second World War, the population had not increased significantly since 1932. This was mainly due to the fact that families were larger back then than they are now, as many as 23 people were recorded in one council house. A list of residents in the parish in 1914. Lords of the Manor from 1086 to 1880. Price, F. D., "", TBGAS 60(1938):135-. Fendley, J., "Chancellor Parsons' Notes on the Diocese of Gloucester c. 1700" TBGAS, GRS 19.